Greenville SC is set among the foothills of the Blue Ridge Mountains in the northwest corner of South Carolina. It is the largest city of the Greenville-Spartanburg-Anderson Combined Statistical Area. Greenville is located approximately halfway between Atlanta, Georgia, and Charlotte, North Carolina, along Interstate 85. 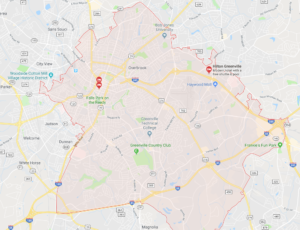 Its metropolitan area also includes Interstates 185 and 385 with access to Interstate 26 connecting Asheville, North Carolina, and Columbia, South Carolina. The city of Greenville is located on land that was once considered Cherokee hunting ground and therefore was closed to settlement by colonists. About 1770, Richard Pearis, an Irish Indian trader from Virginia, moved to the area and married a Cherokee woman. Through various gifts of land, he received a combined total of about 100,000 acres of hunting lands from the Cherokees. Pearis built a plantation called “Great Plains” on the Reedy River (the very heart of downtown Greenville), which included a sawmill, gristmill, and stables together with a trading post. When the Revolutionary War came, Pearis joined the Tories and their Cherokee allies, and together they terrorized upstate Patriots. In retaliation, a Patriot troop raided his plantation, burned his mill and home, and briefly jailed him in Charleston. He settled in the Bahama Islands on a grant from the British Government after the Revolution and so therefore never returned to the upstate, but he left his name on Paris Mountain. After the Revolution, The Cherokee ceded the Upcountry lands to the new state of South Carolina who later distributed it to Patriot soldiers as payment for their wartime services. In 1786, the state legislature formed Greenville (originally spelled Greeneville) County, naming it for General Nathanael Greene, the hero of the American southern campaign. Currently Greenville enjoys a population of over 61,000 residents within city limits. 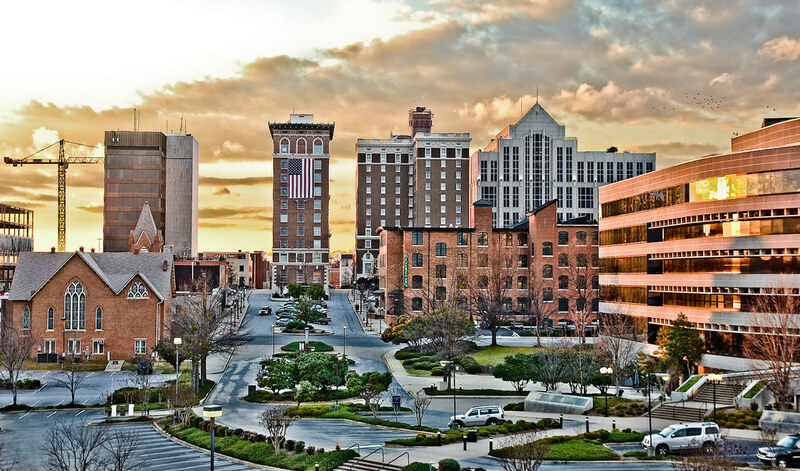 Greenville County has a population of over 474,000 inhabitants and includes cities such as Travelers Rest, Mauldin, Simpsonville, Fountain Inn, Anderson, Landrum, Pickens, Seneca, etc. Greenville County is the largest county in South Carolina and boasts the presence of BMW, Michelin, AMECO, and Hubbell Lighting (just to name a few). There is much, much more to learn so if you wish to delve more deeply into the fascinating history of the city of Greenville, Greenville County, or Upstate of South Carolina feel free to visit the following websites listed below. Better yet, come for a visit and see our Upcountry History Museum in downtown Greenville! The area attractions are endless! They start with the Liberty Bridge, a 355-foot pedestrian walkway spanning the historic Reedy River waterfall in the heart of downtown Greenville, and extend to inspiring panoramic views from the Blue Ridge Mountains. Greenville’s downtown area also boasts hundreds of restaurants featuring a great variety of local and international cuisines as well as designer boutiques and area expertise shops. Local theaters and event venues often host impressive concerts and touring theater companies. During the spring and summer, the local Shakespearean company performs Shakespeare in the Park at the Falls Park Amphitheater. At night the music scene features frequent live performances in the downtown area by local jazz, country, and rock bands. The area’s culture is further enhanced by several art museums such as Andrew Wyeth Collection and the Bob Jones University Museum & Gallery.